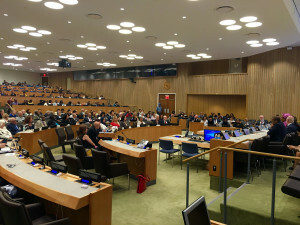 On September 16,2016, at the United Nations Headquarters in New York City, before an enthusiastic audience of over 550, the Permanent Mission of Jamaica hosted the Permanent Secretariat of the World Summit of Nobel Peace Laureates and the Global Security Institute, which organized a special panel conference on the theme Sustainable Peace – Sustainable Development. Three courageous Nobel Peace Laureates — Leymah Gbowee, Shirin Ebadi and Tawakkol Karman –Ambassador Courtney Rattray, the Permanent Representative of Jamaica to the UN and the United Nations High Representative for Disarmament Affairs Kim Won-soo gave inspiring substantive presentations. The panel was moderated by the president of Global Security Institute Jonathan Granoff. The President of the Summit Ekaterina Zagladina was present at the speakers’ board as well. The United Nations videotaped the session and we encourage your viewing it. The passion and clarity of the speakers is well worth sharing. Dr. Ebadi asked people to “be kind to refugees and immigrants” and stated that “the real reason of war on the Middle East is a lack of democracy in these countries” and the value of secular governments over governments that oppress people in the name of religion. She decried the distortions in the media of the religion of Islam and explained that Islam and democracy and human rights are compatible. Leymah Gbowee stated that “violence can never and will never bring peace. We can’t do peace using the same conditions that created war! We can’t do peace by leaving out parts of society” for it is often exclusion and discrimination that caused social discord and violence in the first place. Peace must be an inclusive process and it is very important for woman, who are so deeply impacted by violence, to be part of the peace making process. Tawakkol Karman explained that the 17 Sustainable Development Goals agreed to by all the nations of the world constitute a comprehensive agenda for realistic peace and if implemented would solve all the problems of the humanity. She highlighted the need for governments to sufficiently finance the programs to which they have already committed. This is an agenda that will bring peace because it is injustice that leads to violence and hate. In sum, she emphasized: “There is no peace without justice and development”. Mr. Granoff was a very engaged Chair and pointed out that over 5.5 Trillion dollars has been spent by the United States alone on the nuclear arsenal venture and that military expenditures are done in a distorted pursuit of peace based on an outmoded ancient Roman adage: If you want peace, prepare for war. This approach of peace through strength is not consistent with the actual challenges of today which require cooperation, law and identification of shared interests. Of note was his analogy of the incoherence of our two-tiered security system. He said, ”Imagine if the Biological Weapons Convention, banning biological weapons, prohibited any nation from using Ebola or small pox as a weapon, but permitted nine nations to use the plague as a weapon.” We would clearly see it as immoral, incoherent and unsustainable. That is exactly why the nuclear weapons regime with nine nations claiming that their having nuclear weapons brings a benefit to the world is unsustainable and inordinately dangerous and why we must all work to obtain the peace and security of a nuclear weapons free world.  He explained that the Nobel Peace Laureates had created a Charter for a World Without Violence, which was given to the Secretary General earlier in the day. It begins with a strong motto: Violence is a preventable disease. The inspiring leadership of the three woman speakers demonstrated a medicine capable of curing the disease – courage, caring and wisdom in action.